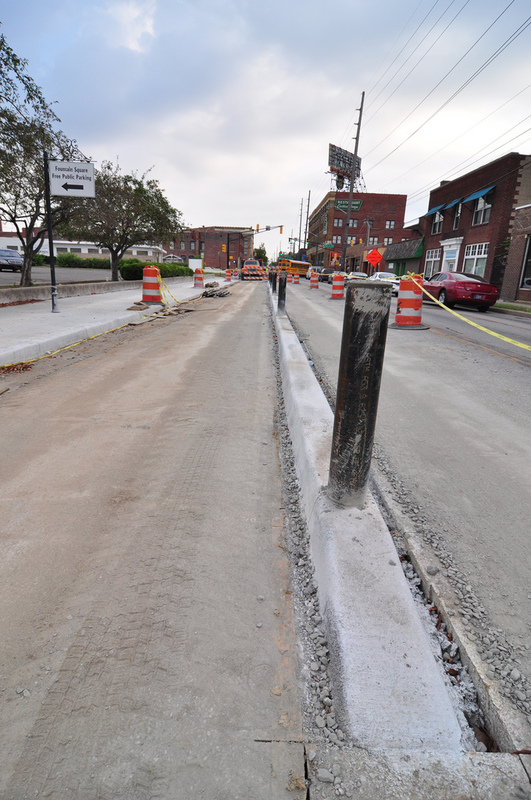 Alright folks, here is your first photo update from me regarding the Shelby Street bike track. Along with IndyCog, we seem to be the only people really charting the progress of this project. I find that amazing since I believe this project will change the way local cyclists think about future bicycle infrastructure. I’ve appluaded the project (here) and also beaten up DPW over the project (here). This post, is the first in what I hope will be a few picture posts charting the progress of Indy’s first on street bike track. can’t wait! keep tracking it Curt! Excellent. Do you know what the surface is going to be? Asphalt? Concrete? Pavers? Hmm. I’m thinking maybe a two-way track on Capitol north of 16th… and an east-west one on 38th between the 100 Acres/Canal and the Monon. Thanks for the update, Curt! Love it and can’t wait to use it! I ride a commuter bike and support all things bike friendly in Indy. Maybe I missed something in the previous post. And maybe I just don’t know as much as I thought I did (highly likely.) What is an on-street bike track? How does it work? Who uses it? Love your blog. Bill, I updated the text with links above. Go check out my previous coverage about this project. It should tell you everything you need to know. Thanks for reading! I am amazed at the boldness of this project. It’s truly a leap beyond what has already been done to accommodate cyclists. And I would not begrudge runners for wanting to use it to even though I don’t suppose they are supposed to. I am concerned that this short stretch will turn into an isolated experiment. But I’ve watched them almost daily as they progress and I must say it seems to move VERY quickly — far more so than the paver-styled trails do (what’s the deal with Virginia Ave?? Turtle-powered, it seems) . So the cycle track concept is a big plus in my book. I hope it becomes the new way for the city to extend into suburbia. I also hope it survives snow plows next winter. I would imagine snowplow protection is part of the purpose of those big steel poles. But I suspect the plows might use the bike track for what DPW always calls “snow storage”…same as sidewalks are used where they are right next to the street. I live right next to the former BMV on Virginia and the explanation we received (from a semi-reliable neighbor) is that when they were relocating pipes and wires between South St and the I-65 bridge, AT&T never showed up because of a miscommunication. Supposedly it will be about 6 months behind (during the winter???). Supposedly the hardscaping on the remainder of Virginia Ave is set to be completed by end of August. Also, I noticed they had poured foundation over by Anthem early last week and ended pulling it all up for some reason. Oops. I think the problem is probably AT&T. 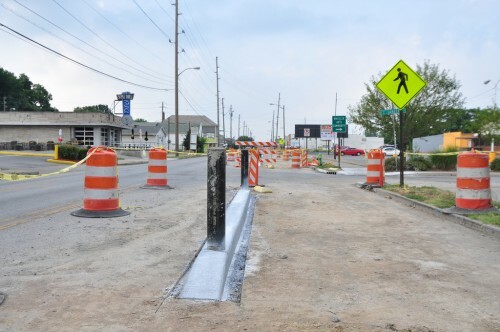 I was told by DPW that they caused significant delays on the 38th Street project (6-9 months at least) during the first part of the last decade. The “we’re the phone company” monopoly culture still seems to be alive there. Glad to see this in Fountain Sqaure. It is good to strengthen to connection to the south of the City to U of I.
I think the one-way streets around Indy make it more difficult to navigate for the unfamiliar, however, I think it makes it much easier to put in more of these without congesting traffic too much. I’m thinking one way streets like Illinois or Delware might be ideal for a two-way, bollarded track like this.